I swear I eat other things other than salmon, but when the hubby is working for dinner it’s easy to make a quick salmon recipe. This one takes the cake because it’s healthy and delicious. Plus, it looks pretty! So yummy! Mix the soy sauce, maple syrup, sesame oil and grated fresh ginger for a quick marinade for the salmon. Submerge the salmon in the marinade. Spray the grill with cooking spray and place the salmon on the grill. Cook for about 8 minutes brushing with the marinade throughout the cooking time. 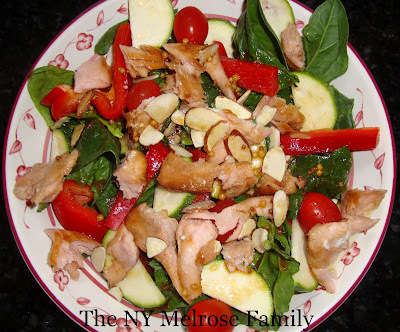 While the salmon is cooking, mix the ingredients for the dressing. Prepare the salad with the desired vegetables. I would have added julienned carrots and sliced mushrooms if I had them in the house, but I used what was available to me. Once the salmon is done, break it apart and place it on top of the salad. Add the dressing over the top. One quick tip is to keep your fresh ginger in the freezer after the first time you use it. It’s much easier to grate this way and it keeps for months! That really is a pretty salad! I love anything with maple in it! Saved it in my recipe file. Ohhh that looks SO good!! I love salads,but never thought to put Salmon in there! okay missy you are going to have to stop posting all these awesome recipes before I gain more weight. Your carrot cake cupcakes rocked!! I am not much of a salmon person but this looks great. Looks delicious! Since my boyfriend just got back from a fishing trip we have tons of salmon! I'll have to try this one out! Pinned to the list! This looks yummy and easy enough to do! I love all your recipes! Oh yum! I eat with my eyes first, and I love how colorful this dish is! Thanks for sharing at oopsey daisy! I'll have to share this with my sister. She loves salmon. Thanks for sharing at Handmade Tuesdays. This looks great. Thanks for linking up to Tout It Tuesday. I will be tweeting your recipe on Friday night. Ok I'm hungry now! This looks yummy! This very cute and clever! It would be fun if the mommy-to-be proceeded to take pics of each month in the onesie! Looks delicious! Perfect for a hot summer night. Thanks for sharing at Terrific Tuesdays. 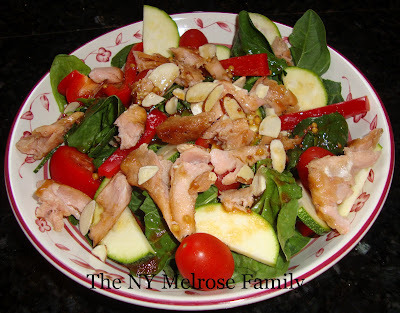 The colors the flavors.. everything about this recipe says healthy and delicious. Please share this on my foodie friday linky today. Thanks for a great, healthy recipe! Glad you shared at Shine on Fridays! Yum! Always looking for good, healthy recipes! Thanks! This just put me in the mood for Salmon. Yum, thanks for the recipe! Healthy, yummy, and easy…I'm in! Thanks for sharing this pretty recipe with us! I've been looking for some new salmon recipes and this looks delicious! Thanks so much for sharing at Mom On Timeout! I'm not much of a fish person, but this looks very very yummy!!! Thanks for sharing at Sharing Saturday. Hope to see you again this weekend. 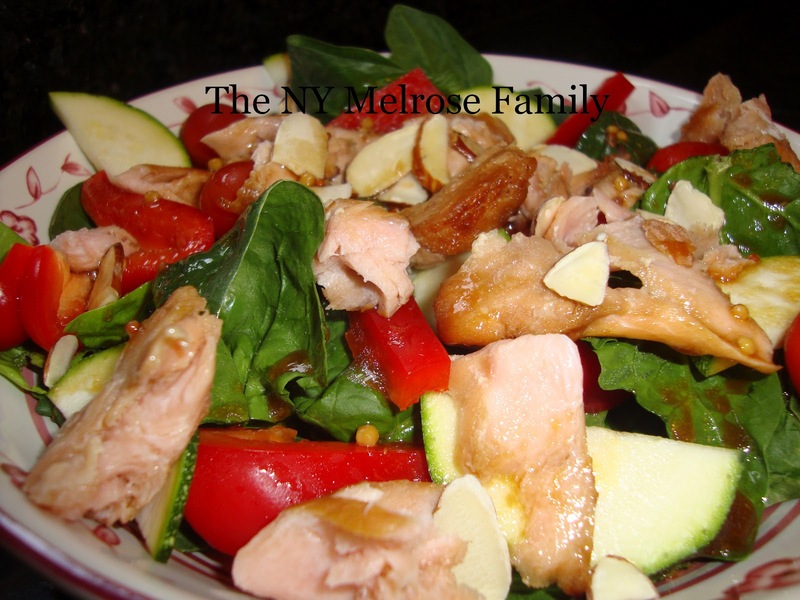 Thank you so much for linking up this recipe to Dare to Share. I do agree it is one nice looking meal. I hope you will come back and share some more post on this weeks Dare to Share. We are salmon lovers as well, and I love salad in the summer. Grilling, too. It’s healthier and doesn’t heat up the house! This looks amazing! Right up my alley! !